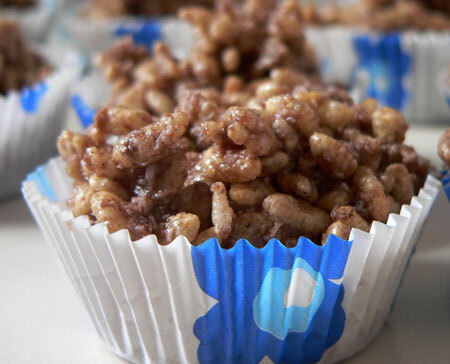 Party food, ie chocolate crackles, and a suspension from school? Let’s see if I can do a neat segue. My friend’s son had a 5th birthday party yesterday afternoon. The night prior my friend rang to ask me for a chocolate crackles recipe. It so happened that I had all the necessary ingredients as this is something I promised to do with JJ. In a moment of weakness I offered to make them and bring them along with me. It’s the first time I’ve made them and it was dead easy. The recipe is on the side of the Rice Bubbles packet. In a large bowl mix the Rice Bubbles, icing sugar, coconat and cocoa. S lowly melt the copha in a saucepan over low heat and allow to cool slightly. Add to the rice bubbles mixture, stirring well until combined. Spoon the mixture into paper patty pans and refrigerate until firm.This will make about 24. So I made these just before I went to school to pick JJ up. I was sitting outside his classroom when he came back with two other boys and the deputy principal and an envelope in his hand. The other boy said ‘we’ve been suspended’. Apparently there was an incident at lunchtime that involved kicking. I still haven’t got the full story but will find out at the suspension conference early this week. JJ has had some detentions this year and it seems to boil down to mixing with this kid who gets him into trouble and not knowing how to behave in the playground. He also has trouble making friends at school. I felt like I was rewarding him by taking him to the party but because it was a good friend’s birthday and we’d promised to go, we went. JJ is without tv and computer for one week and this will be reviewed after a week. Just when I thought I’d achieved something with JJ’s behaviour this goes and happens. He’s fine (mostly) with me, and friends that had him for a couple of days over Easter noted that he was really good for them. So school, and this other kid, are the common denominator. The school wants to work with us to resolve this so this time I’ll be making sure that this happens. One of my new favourite websites is PSDTUTS.com (PSDTUTS is short for Photoshop Tutorials – the PSD is the Photoshop file extension). It’s laid out really well for the novice by showing step-by-step instructions on how to do stuff in Photoshop from scratch, and with existing photos. I was having a play around with this tutorial and thought I’d adapt it for my own website banner. You may have to refresh the page to see the new banner, or here’s a thumbnail. If you’ve clicked over to look at the tutorial you’ll note that mine is very very different from it. I took the principals of the tutorial and went quite off track – really off track. Instead of using a gradient I used a pattern which explains the texture, although there still is a gradient or two included. I also used some brushes because I love brushes. I already had some brushes I’d downloaded previously but I found some more at Obsidian Dawn. Did I say I love brushes? I don’t begin to use half of the features in Photoshop but I want to make it my mission to learn to do so. This was my old web banner. (click to view larger image). I think I’ve said on this blog before that Facebook is a virus and I only really use it to play Scrabulous. Today I logged into Facebook to clear some of my requests and thought I’d do the ‘their, there, they’re’ test but it won’t let me unlock the results until I spam all my friends with it too. Sod that. I know I got 100%. And it seems that any application I may choose to install wants me to spam all my friends also. I can’t add a Lil Green Patch request without first sending more off to my friends. I’ll do that in my own time thanks, or not because I don’t like being TOLD what to do. And those Funwall messages aren’t just for me, they’re for everyone they were sent to. Surely there’s an application that’s user friendly that doesn’t expect me to spam all my friends? Even my Flickr Gallery was giving me grief and not letting me update. Come on you Facebook application writers – do something not so spammy. Think of the users! If it’s good it will spread anyway.